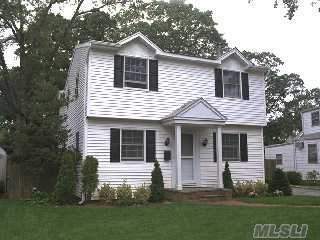 Welcome To This Great 3 Bedroom, 1.5 Bath Colonial! The Family Room Has Sliders To A Rear Deck, An Awesome Bar For Entertaining And High Ceilings. New Granite Eat In Kitchen With Side Door Access To The Driveway. Dining Room And Formal Living Room With Wood Burning Fireplace. Close To Lirr And Shopping.